Enzymes are saving my life. Many scientists have done extensive research on the role of enzymes in the treatment of disease, as well as its overall benefi ts in the body. Thanks to these efforts, we have a deep understanding of the importance of enzymes in our body. The most important thing, however, is that we apply this knowledge in our daily lives. While it is true that enzymes help with our health and longevity, we must take a harder look at our daily habits to maximize the benefits of enzymes in our bodies. While enzymes are currently used to treat many diseases, these treatments require several important conditions to be effective. The most important of these is that enzyme supplements require adequate intake of a balanced, nutritious diet. It is not unlike setting up a clean canvas to being painting a picture. Even the most beneficial enzymes will have no effect without an appropriate diet. Therefore, we will examine some ways to improve our diets and see what we can apply in our daily lives. Enzymes that help clean and prevent infection in the intestines require a sufficient supply of dietary fiber to be effective. Even if the enzymes work vigorously to carry out the decomposition of waste materials in the intestines, fiber is required to move these materials out of the body. Therefore, it is important that consume foods with a lot of fiber, such as vegetables, fruits, and kimchi. You can generally assume that cooked foods do not have a significant amount of enzymes. This is because most enzymes cannot withstand temperatures of more than 70 degrees Celsius. Even foods high in enzymes, such as fermented kimchi or miso paste, have almost no enzymatic benefits when cooked, for example, in a stew, as the enzymes inside will become denatured or effectively “dead”. Therefore, whenever possible, it is best to eat foods raw or otherwise prepared at low temperatures. Processed foods have not only gone through a process of heating and sterilizing that usually destroys or denatures all of the enzyme content, but also contains large amounts of additives that are not good for our body. It is imperative to avoid these kinds of processed foods as they are often very high in artificial additives, sugars, and fats. Setting aside time for a moderate fast can be a very good way to improve enzyme health. Fasting helps remove leftover waste and toxins accumulated in the intestines. This will help increase the efficiency of the enzymes in the body, boosting metabolism, increasing the body’s ability to overcome diseases, and increasing potential enzymes. Overeating is one of the biggest cause for waste of potential enzymes in our body. For example, just eating one steak consumes a large amount of enzymes to break it down. Therefore, it is very important to be thoughtful in what you choose to eat. The fundamental purpose of nutrition to intake a balanced diet that includes the appropriate amounts of nutrients, vitamins, and minerals that our body needs. However, to achieve this balance, sometimes it is also necessary for us to empty our body out. Therefore, alternative medicine experts in many countries have developed therapy called called half-fasting or single-fasting. Experts in France have called this kind of therapy “surgery without the scalpel.” The fundamental principle behind the fasting therapy is simple. For example, in nature, when animals are sick, they will often go several days without eating, even if it is readily available. By doing this, animals are burning away the toxins, fats, and wunwanted tissue in their bodies as the body continues to empty itself of these waste products in order to help fi ght the disease. Similarly, this process is often used prior to or after medical treatments or for detox diets, both of which trying to reduce the amount of toxins and waste products in the body. This kind of fasting also helps replace enzymes in the body that also help with breaking down fat and eliminating toxins. Enzymes can have a very positive effect on what many call “lifestyle diseases,” like diabetes and atherosclerosis (high blood pressure), as well as on incurable diseases such as AIDS and cancer. Let’s examine the role of enzymes on these various types of diseases. Autoimmune disease are diseases caused by irregularities in the immune sysstem, and can include diseases like gravis, Chron’s disease, and multiple sclerosis. These diseases occur when the cells that make up the immune system begin mistaking other cells in the body as enemies and attacking them. In modern medicine, these are often treated with therapy to relieve the symptoms of the disease, rather than a de facto treatment of the conditions that cause them. However, alternative treatments such as physical therapy, acupuncture, moxibustion, healthy dieting, and volume intake of enzymes have also shown very good results. Arthritis and back pain is not an issue that is limited to the joints. In fact, in many cases, indigestion has been a cause of signifi cant degradation in the arthritic conditions. When the body does not properly decompose amino acids, it releases nitrogen oxide in the bodies that create a butterfl y effect that ladder down to painful muscle contractions in various parts of the body. Therefore, in many cases, an enzyme supplement called RA is often 4 HEALTH JOURNAL used to neutralize toxins in the blood and facilitate smooth digestive activity, gradually reducing intestinal damage until the pain disappears. Cancer is known to be an incurable disease that is difficult to treat. Therefore, taking steps to prevent the onset of cancer is one of the most important things we can do. Enzymes have a very positive effect in preventing cancer. In fact, the lack of dietary fi ber and enzymes is widely regarded as one of the primary reasons for the development of cancer. On the other hand, excess intake of enzymes can also be a cause of cancer, as well as facilitate rapid aging of the body and organs, development of ammonia nitrogen and other carcinogens. Therefore, it is important to intake the appropriate amount of enzymes for proper health and to avoid and prevent the development of cancer. Bloating, belching, diarrhea, stomach pain or discomfort, bad breath, etc. are all essentially categorized as gastrointestinal disorders. This also an area where enzymes have an extremely positive effect.. Administration of enzymes in the stomach can alleviate most of these symptoms effectively decomposing and draining the body of toxins and waste products. Bronchial asthmas is often considered a disease that is limited to the lungs, but a closer look reveals that it is also related to intestinal contamination. In most cases, the immune system is responding to an overdose of sugar or protein in the blood due to the inability to break down these products in the intestines. It is also why this condition cannot be treated by common steroid therapy. In fact, many asthmatics look at the underlying effects of collected waste and toxins in the intestines and colon as a cause for certain respiratory conditions and recommend the administration of intestinal enzyme supplements as a form of treatment. Foods that are high in protein and fat can be fatal to diabetics. Instead, they are often recommended to intake foods high in dietary fiber such as fruits and vegetables, but this is not always enough. The absorption of dietary fiber and other nutrients require a sufficient supply of healthy enzymes. Therefore, it is important to know that natural enzyme replacement therapy can be an excellent alternative to reliance on chemicals and hypoglycemic medication. Many experts often say that they cannot overstate the importance of enzymes to good health. Nevertheless, we still only focus on the six other categories of nutrients when it comes to discussions about diet, metabolism, and overall health. Therefore, we want to create a road map of sorts that show us the benefi ts and importance of enzymes in improving our health, eating habits, and everyday life. We need to understand that what happens with enzymes will affect what happens with our health and our lives. Being busy cannot be an excuse for taking care of ourselves and investing time in our health every day. Enzymes are an essential substance for our bodies, and consuming foods high in enzymes is very important, but there are certain limitations when it comes to the intake of enzymes through our diets. For busy professionals, students, and homemakers, taking time to stop and care for your health is not an easy task. Plus, all around us, we are constantly surrounded by an environment that makes eating healthy a really difficult thing to do. Our busy schedules and daily stress have a negative impact on our health and dietary habits. In these circumstances many of us have diets that suffer from enzyme defi iciency or enzyme overload. Therefore, it is important to take a good look at the various enzyme supplements on the market that will provide a steady supply of the appropriate amount of enzymes, not only to make up for enzyme deficit, but to maintain continuous levels for your long term health. Developed by Japan’s foremost experts in fermentation research, Umeken’s enzyme pills have been are derived from a three-step fermentation process derived from 108 different types of fruits, vegetables, and herbs from the beautiful forests of Brazil. Umeken enzyme supplements contain an essence of youth a vitality prevalent from its pure and clean origins in brazil, but also go through a rigorous method of refi ning and fermentation to keep the nutrients and benefi ts intact. 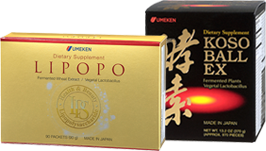 Umeken enzymes are one of the best ways for us to supplement our body’s enzyme deficits.